It’s the Thursday before Halloween! Anyone else excited to do whatever you do on Halloween? I’ll be out taking my kids trick or treating, and then we’ll probably end the night watching Tim Burton films and eating way too much candy. I did want to share a look today in case anyone needs some true last minute inspiration. 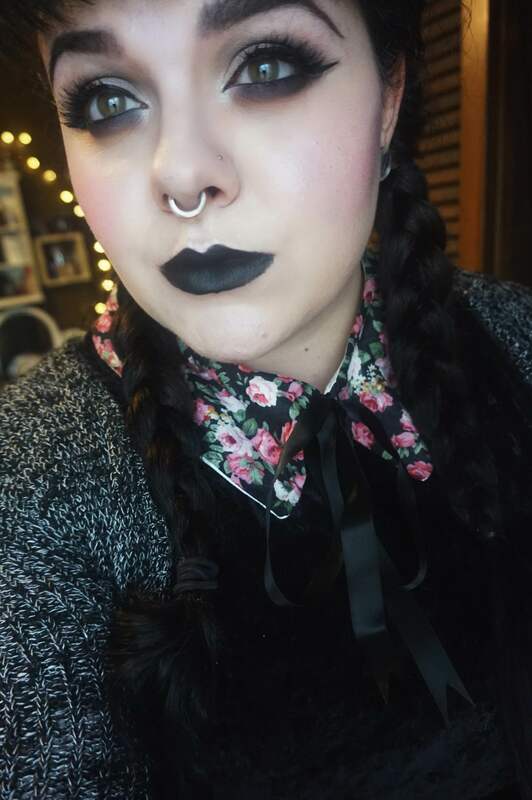 I’ve been told I look like Wednesday Addams (specifically Christina Ricci) since I was really young, so why not see if that’s actually true? This look was really fun, cute, and simple to put together. 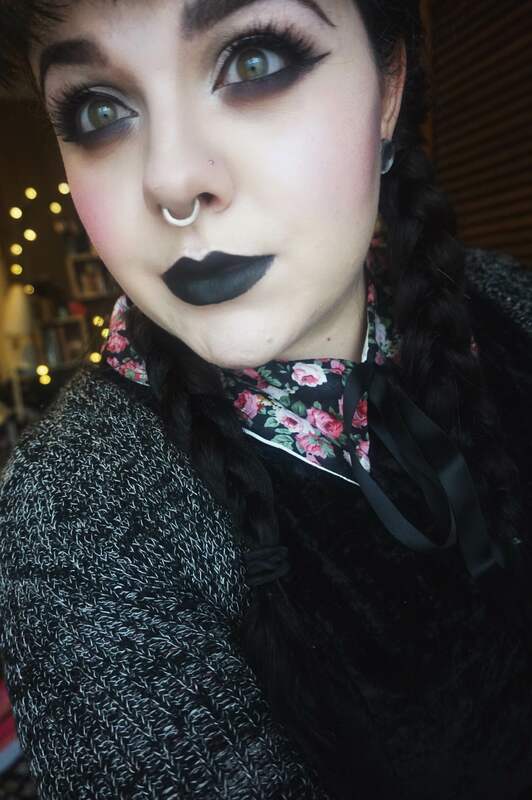 Wednesday Addams is one of those characters where you can put on just about anything and braid your hair, and chances are many people will know what you were going for. Or at least I hope. Foundation: Estee Lauder Double wear in cool bone mixed with Manic Panic’s white dream tone foundation. Primer used was the Laura Mercier hydrating primer. Powder: BH Cosmetics Studio Pro setting powder for a matte finish. Concealer: None. The dark circles I’m sporting today are actually mine. If you don’t have dark circles you can always create them using gray shadows. Truth is, I’m usually self conscious of my dark circles because I was told so often I looked “sick” but lately I’ve been trying to embrace them more. They’re a part of me. Contour: Lunatick Cosmetic Labs cool contour kit. I did contour my jaw and my nose a bit more just so I could have a bit more of an upturned look. Fortunately, my nose shape is similar to Christina Ricci’s, which is probably why people thought I looked like her. Blush: I didn’t want to have no color to my face, so I used the BH Cosmetic’s Lilac blush. It’s a really subtle cool toned purple blush. Highlight: Colourpop’s “Hippo.” I made sure to highlight the very tip of my nose a bit extra just to add to the illusion that my nose is a bit more upturned than normal. Brows: Anastasia Beverley Hills dirpbrow pomade in “ebony” set with Nyx’s brow mascara in black. Eyes: This is such a simple eye look, and yet very bold and dramatic. I used Nyx’s “SOS” as my transition shade. I then blended Colourpop’s “Girl Crush” in the crease and put “Mixed Tape” on the lid. 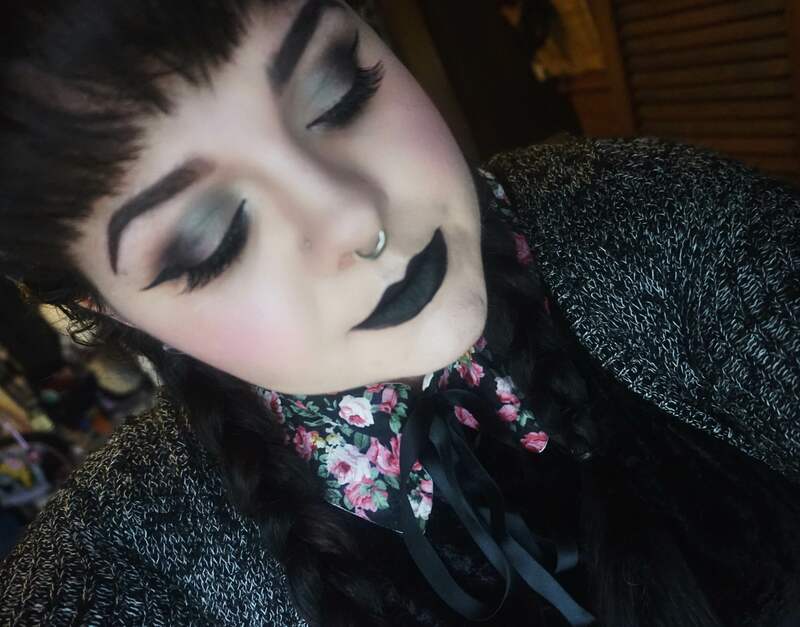 You could go with white, but I wanted a full gray smokey eye. The outer corner is “Straight Trippin” by colourpop. I almost went with black, but I’m glad I went with this deep purple shade instead. It really brought out the “I haven’t slept” look I was going for with my dark circles. I winged my liner, but this look could easily be done with just a smudged lash line with mascara as well for a more grungy look. Lashes are some demi wispies I found off Ebay. On the lower lash line I used Straight Trippin and blended that out with SOS . I’m really dramatic with my lower lash line, and I wanted the eyes to be super dark and very striking. Inner corner highlight is “polyster bride” by Urban Decay. Lips: La Girl’s new matte lipstick in “Raven.” This applied really well and is pretty matte. I have 7 of these in all that I will be doing a review on once I catch up on everything else I need to do reviews on. Lawlz. Collar: This floral peter pan collar is from Salem Couture. Many places sell shirts with peter pan collars, but I wanted to use what I have in my wardrobe, and I own a few of their collars. They’re really cute and can be used with any shirt! Dress: This was actually a $7 Marshall’s find over the summer. It’s just a cute little black velvet skater dress. I threw a cardigan over it to complete the look! Another outfit idea would be a pair of black jeans, flowy black top and chunky boots, or a long flowy black dress. I have no idea why I imagine Wednesday growing up to be more punk than goth? 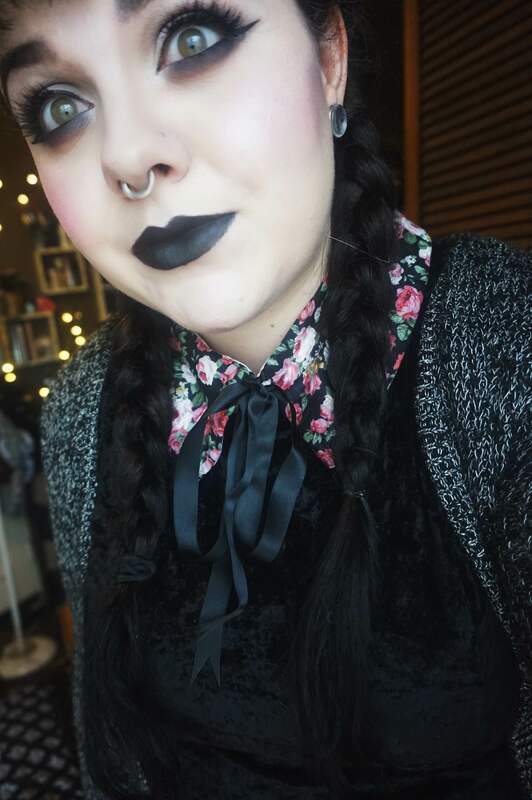 That is it for my quick and simple Wednesday Addams look! I hope you all enjoyed this. What are your costume ideas? Yes! You DO totally like like Wednesday Addams! Great look. 🙂 That La Girl’s new matte lipstick looks intense. Thank you! It is pretty intense, and so far I like them!